Sparkling ring on your ring finger? check. Handsome husband-to-be? check. Engagement party with champagne overflow? check. Now it’s time to start planning your big day! 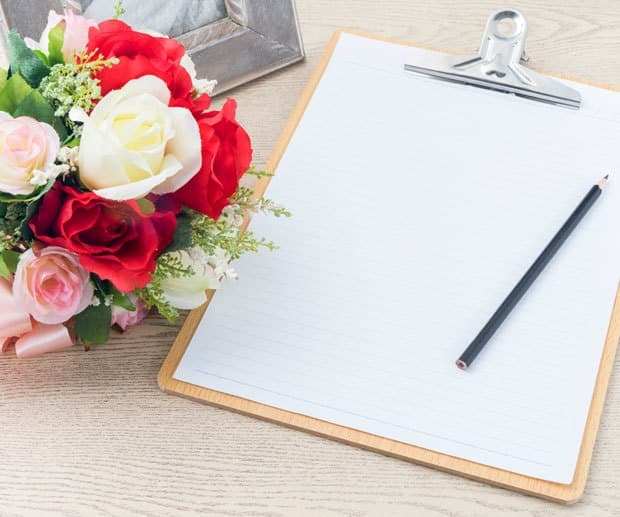 But before you book the most popular wedding suppliers on Pinterest and Instagram with a pricey wedding fee attached, take the time to create a wedding checklist that will ensure you don’t blow your budget. While wedding ceremonies held at religious institutes are relatively affordable, as many places of worship only ask for a donation to hire their venue, the cost of a ceremony can soar if you decide to say “I do” in the great outdoors. For instance, one Mozo staffer was quoted a pricey $12.50 per white fold out chair and with 140 guests attending that was going to set her and her hubby back a massive $1,750 - and she hadn’t even factored in the flowers yet! How to save: Consider having a standing ceremony and spend the extra cash on giving your guests a glass of bubbly. It’s sure to make for a unique wedding ceremony experience for both yourself and your guests. Another way to save on the wedding ceremony is purchasing your flowers wholesale from your local flower markets - a great way to give your bouquet and flower decorations your own unique flare. Wedding receptions in Australia are pricey. In fact the Cost of Love survey found Aussie couples were forking out on average a massive $132 per guest! How to save: Apart from culling your wedding guest list (which is sure to get mum and dad all fired up) and getting married in the chilly part of the year, a cocktail reception is often a much cheaper option than the sit down alternative. And you can’t go wrong with DIY reception decorations, as well as DIY place cards, menus and table numbers that you can create with your girlfriends by visiting cheap craft stores. Any bride-to-be will know finding the right bridal gown should be high on the wedding budget checklist, especially since all eyes will be on the bride for the entire day (eek!). But that doesn’t mean you should blow your wedding budget on a pricey headpiece, veil, shoes and more. How to save: Vintage is all the rave these days, so hit up your local second hand stores to see if you can grab unique wedding accessories at a bargain. Plus you’ll tick the “something old” off your list. And when it comes to your wedding gown, often the best way to save is buying the bridal dress off the rack, which can cut 50% off the price tag. While you might not be as involved in choosing the groom’s outfit as the other points on this wedding budget checklist, you could still help your fiance find a sharp suit at a great price. How to save: One way to save on the groom’s attire is by hiring a suit for the big day or if it’s a casual affair he could simply rock some chinos and a crisp white shirt. Or as suggested in the point above hit up the local second hand stores for a retro suit (a good option for the hipster grooms out there!). Capturing your big day is an important consideration, as these are the photos you’ll show your grandkids one day. How to save: Once you’ve booked the ceremony, reception and found your bridal gown, your budget may be looking a bit worse for wear. So if the photography budget isn’t what it was when you first started planning your wedding, consider just having one photographer. Or forfeit a photographer completely and purchase portable cameras that you put on each reception table and let your guests capture the moments of your big day in a personal way. Also don’t forget to create your own hashtag #mrandmrsawesome! Ah the wedding bands, those shiny pieces of metal that show you and your hubby are now one married unit. How to save: Silver is your best option for saving on your wedding bands but if you’re set with having a gold ring, keep in mind if you haven’t purchased your engagement ring yet most jewellers will give a discount if you buy both your engagement ring and band as a duo. There’s a few things you’ll need to consider when hiring a wedding car - how long will you need the car for? how many people will be travelling? But you’ll also obviously need to think about what type of car is right for your wedding theme. How to save: Travelling by hummer is so 1999, and who wants a Mr T vibe at their wedding? Instead consider hiring a retro volkswagen van that are often available at a much cheaper price than hummers, classic cars and stretch limos. Another way to cut down the cost of transport is by having your wedding ceremony and reception in the same place. Cutting the cake is one of those big moments when you and your husband cheekily shove a piece of cake in each others faces and then hit the dance floor to party with your family and friends. How to save: According to wedding cake designer Faye Cahill opting for a plain-iced style cake with fresh flowers is more affordable than paying for handmade sugar flowers and hand detailing. Read our hottest wedding cake trends of 2015 article for a full rundown of Faye’s wedding cake tips. When it comes to hitting the dance floor, have you considered what type of music your guests will be boogying or should we say twerking down to? How to save: If you really want to save on the music, don’t have a DJ. Instead compile your favourite songs on your iPod with a section for each stage of the wedding e.g slow dance time, cake time, party time and then plug it into the sound system and start the party! 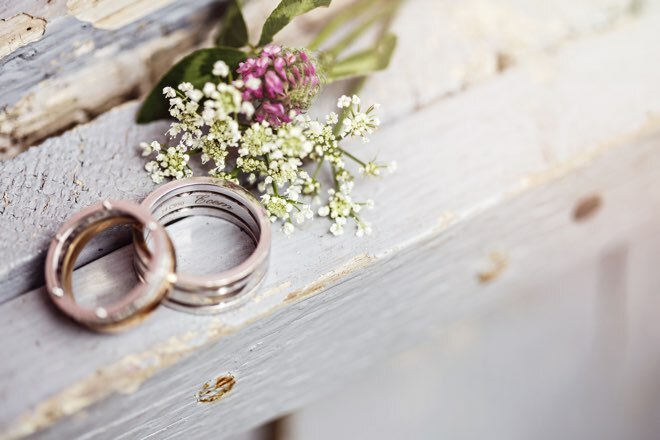 While the Honeymoon may be last on our wedding budget checklist, it is the second most pricey wedding expense found by the Cost of Love survey. How to save: Organising your wedding can often be a whirlwind experience and if all you want to do after you tie the knot is sip mojitos by a glitzy resort pool, then why not jetset domestically? You’ll save yourself big bucks in airfares, as well as overseas currency conversion fees and ATM withdrawal fees. If you’re set on globetrotting the world on your honeymoon, think about a digital wishing well, instead of gifts where your guests deposit their cash gift into a dedicated honeymoon account, with a high interest rate. And also make sure you compare the travel money market to find a good deal and protect yourself from the unexpected by taking out a competitive travel insurance policy with unlimited medical cover. So there you have it, 10 major wedding costs and the top ways to trim them. For a month by month to do list, read our Ultimate 12 Month Wedding Costdown guide.